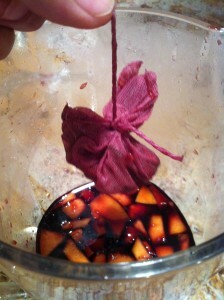 Sangria is of Spanish origin, the word deriving from “sangre,” meaning blood. The correct spelling uses an acute accent: sangría. The blood-red wine punch became popular with the English around mid 1700’s. It came to Latin America and to Texas once the Spaniards began their voyages here. Sangría is simply red wine with macerated fruit. It is drunk cold during hot weather. My title, “Authentic Recipe,” is of course tongue-in-cheek. As I’ve said before: What authentic? What recipe? Wine with macerated fruit and a little sweetener, that’s it. When a stronger spirit is added, like brandy, the Spanish call the drink Zurra. But we in Texas and the rest of the world still call it Sangria. I wrap the cinnamon in cheesecloth so that there are no splinters in the drink. 2. Add the orange juice, lemon juice, wine and cinnamon and place in the refrigerator for one or 2 hours until very well chilled. 3. Just before serving, add 6 ounces lemon-lime soda and mix. 4. I like to serve the Sangría in double old-fashioned glasses with a few ice cubes as pictured above. Yes, El Conde, please let me know how it turns out with the Meyer lemons. I love the taste. Hmmm, canteloupe sounds great! A few years ago, while visiting Spain, we tried their Sangria (several places) and it was fantastic! I kept trying to figure out what the difference was and I narrowed it down to the type of lemons they used, they seemed to be “sweeter” than ours. Now, we have a Meyer lemon tree and I believe they use a type of lemon similar to the Meyer. It is somewhat sweeter than a run-of-the-mill lemon. 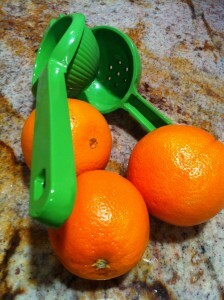 I’ll use your recipe and try one of our Meyer lemons! By the way, in Spain, they also sometimes add cantelope in their Sangria. Heavenly! thank you very much, will let you know how it goes!!! !